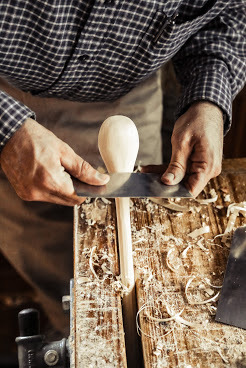 Earlier this year, the Popular Woodworking Magazine blog promoted several of the magazine’s spoon making resources. There is now a Facebook group of spoon makers and greenwood craftspeople that boasts nearly 5,500 members (myself included). And more recently, over at the Lost Art Press blog, Chris Schwarz has posted an old, one-page article from The Woodworker magazine, which is worth a look. (Chris also shares his own early, traumatizing experience with spoon making.) The article, which Chris says was probably written by Charles H. Hayward, is a brief look at the design of the hand-carved wooden spoon. Hayward suggests that wooden spoons were developed in England in the 17th century, though we now know that they were used throughout Medieval England, and almost certainly earlier, though intact examples are difficult to come by. F or some reason, as soon as spoon making comes up, somebody will bring up Celtic “love spoons,” as Hayward does in this article. I’m not terribly interested in these artifacts, and I don’t quite see why they should be lumped together with functional wooden spoons. As far as I can see, they share only three similarities: they are made of the same material (wood); they are made using similar tools (carving knives); and they both have some sort of hollowed “bowl” attached to a oblong bit of wood. You might as well lump together cauldrons and church bells. As works of fine art, love spoons can be beautiful in their own right, but they are utterly useless and intentionally so. Real wooden spoons, on the other hand, are judged primarily by their usefulness. Their aesthetics are directly connected to their function. A good spoon both looks good and feels good in use. Nevertheless, I’m pleased that wooden spoons are finally getting some publicity in the USA. I hope that will mean that we will soon see a wider range of spoon making tools becoming available, and that spoon making resources will continue to proliferate. Yet, as G. K. Chesterton once said, “Fashions come and go, but mostly go.” Me, I’m going to keep making functional kitchen spoons as often as I can. This entry was posted in Carving, Musings, Woodenware and tagged Charles Hayward, love spoons, spoon making. Bookmark the permalink.